Prof.&Head department of Orthodontia in the Faculty of Odontology of the de Universidad Michoacana de San Nicolas de Hidalgo, Morelia, Michoacán. Facultad de Biología, edificio "R" Ciudad Universitaria U.M.S.N.H. Morelia Michoacán. Para efectos de referencia bibliográfica este trabajo debe ser citado de la siguiente manera: Ballesteros,M. Corona,D. , Ferias,H. Almanza,V.Lemus,J. 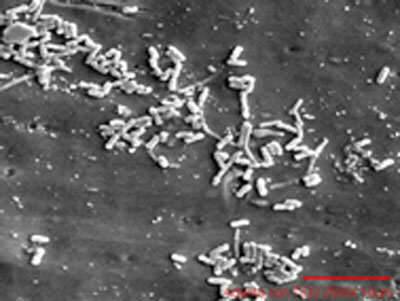 "Biocorrosion in vitro en cinco marcas de arcos dentales de Ni-Ti en presencia de Alcaligenes faecalis.". The orthodontic materials have a continue interaction with the fluids that are produced in the mouth, in consequence, this arches can corrode by diverse factors around these. Recently, the orthodontic arches of Nickel-Titanium (Ni-Ti) are one of more used in the treatment of dental malocclusions in this country. The application of a covering of "Titanium Oxide" or Titanium Dioxide (TiO2) is the most recent development for counter the corrosion principally because it has high biocompatibility and chemical stability. Were inoculated dental arches (with and without covering of TiO2) of five different brands (ADenta, Borgatta, AH-Kim, Lanser and Ortho) in Czapek medium with Alcaligenes faecalis during 30 days at 35ºC ± 2ºC; the average period that an arch is exposed in the oral environment and analyzed with Scanning Electron Microscopy (SEM) techniques. The arches with a covering of TiO2 are more resistant than arches that not have TiO2. However, the film of TiO2 in the arches increases the bacterial establishment. The Ni-Ti dental arches and all kind of orthopedic material need to have different qualities that should be considered before to use this materials in medical treatments; chemical composition, morphology, structure, electric potential, surface energy, etc. and principally the exposure time of the orthopedic material to environment. Key words: Biocorrosión, Ni-Ti arcs, bacteria Alcaligenes faecalis, orthodontic materials. Los materiales ortodónticos tienen una interacción continua con los fluidos que son producidos en la boca, en consecuencia, éstos pueden corroerse por diferentes factores que los rodean. Actualmente, los arcos de Niquel-Titanio (Ni-Ti) son uno de los más usados en el tratamiento de maloclusiones dentales en éste país. La aplicación de un recubrimiento de "Óxido de Titanio" o Bióxido de Titanio es el desarrollo más reciente para contrarrestar la corrosión principalmente porque tiene alta biocompatibilidad y es químicamente estable. Fueron inoculados arcos dentales (con y sin recubrimiento de TiO2) de cinco marcas comerciales diferentes (ADenta, Borgatta, AH-Kim, Lanser y Ortho) con Alcaligenes faecalis en medio de cultivo Czapek durante 30 días a 35ºC ± 2ºC; el periodo promedio al que un arco es expuesto en el ambiente bucal y analizados con técnicas Microscopia Electrónica de Barrido (MEB). Los arcos con un recubrimiento de TiO2 son más resistentes que los arcos que no tienen el recubrimiento de TiO2. Sin embargo, la capa de TiO2 en los arcos incrementa el establecimiento bacteriano. Los arcos dentales Ni-Ti y toda clase de material ortopédico necesita tener diferentes cualidades que deben ser consideradas antes de usarlos en tratamientos médicos; composición química, morfología, estructura, potencial eléctrico, energía superficial, etc. y principalmente el tiempo de exposición del material ortopédico al ambiente. Palabras clave: Biocorrosión, arcos Ni-Ti, bacteria Alcaligenes faecalis, materiales ortodonticos. Orthodontic materials continuously interact with the fluids that occur in the mouth, and consequently they may corrode by the various factors that surround them: pH, protein, bacteria, secondary metabolites, etc. Orthodontic arches are formed into various configurations and alloys subjected to multiple procedures and their aim is the application of dental mobilization forces. The use of Ni-Ti wires (55% nickel, 45% titanium) has grown considerably since its introduction in the decade of the seventies, and its properties of elasticity and memory, is one of the most commonly used today. The study of surfaces of wires and attachments of different alloys used in orthodontic treatment is of clinical importance, not only the mechanical aspects of the treatments themselves, but by the interaction of materials to the oral environment and its biological local effects local (Chaturvedi, 2009). The nickel-titanium alloy or Ni-Ti was developed by William F. Buehler in the early 60's. The original Ni-Ti alloy containing 55% nickel and 45% titanium (Graber, 2006) Titanium oxide is a stable compound, highly resistant to chemical action of most substances. The excellent chemical resistance and corrosion resistance of titanium is due to the presence on its surface chemically stable oxide (Tengvall et al. 1992). Oxide distributed in a thick film between 5 and 10 nm, which protects the metal from chemical attack, including the aggressive body fluids. This factor should not be confused with that is chemically inert. In fact, titanium oxide surfaces react in aqueous solutions and absorb and dissociate organic molecules, often acting as catalysts for many chemical reactions. 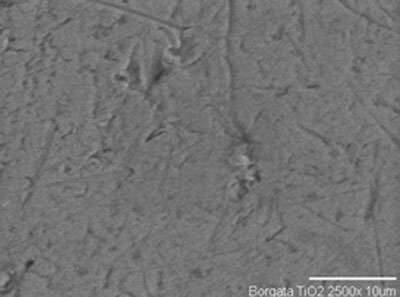 This oxide layer acts as a protective barrier to prevent the action of any ion from inside the metal to the physiological environment. This has a direct impact on the reactions that titanium has both in vitro and in vivo, ie in its excellent biocompatibility (Henrich and Cox, 1994). Nickel and chromium induce to IV hypersensitivity type in the body and this reaction can act as a carcinogen and mutagen. These metals cause cytotoxic responses as decreased enzymatic activity, interference biochemistry, carcinogenicity and mutagenicity (Chaturvedi, 2009). In fact, allergies are common to nickel (some sources indicate that 16.9% of men and 23.8% of women, or even 28% of men and 31.9% of the women present) (Graber, 2006). The nickel-titanium arches can cause tissue irritation in some patients. Manganese alloys evolved from some in combination with saliva can cause nerve toxicity, disorders of the bones and so on. Recent reports suggest that prolonged exposure to nickel affects human monocytes and cells of the oral mucosa (Al-Waheidi, 1995). Alcaligenes is a genus of several species of Gram-negative pathogenic and opportunistic. Most free-living and reported as facultative anaerobes. Discovered in feces, but later found in many places in the environment, mainly water and soil, A. faecalis is considered non-pathogenic and rarely an opportunistic pathogen in patients prone to infections, such as immunocompromised or anatomo-functional organs and systems. The clinical manifestation known by that agent is acute otitis media, in turn, is an uncommon (Olivares, Palenciana and Closed, 2008). This work is part of a project that began with the isolation of bacteria that promote corrosion. 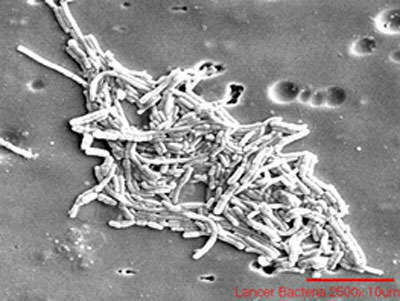 (Martínez 2009).The bacterial strains isolated from different dental arches that were patients over a period of six months. 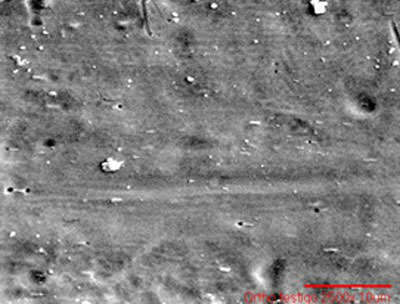 This threw us important findings: first, identified a wide variety of bacteria that are part of the normal oral bacterial biota, however, to remove organic compounds from the culture media (to create an enabling environment for the growth of bacteria received only nutrients that can have a material orthodontic) and only in the presence of metal arc, we determined the presence of a single type of bacteria which were identified by molecular biology techniques such as A. faecalis. In this case, were used five brands of dental arches provided by the Orthodontic Postgraduate Division of the U.M.S.N.H. ADenta, Borgatta, AH-Kim, Lanser, and Ortho. These arches are some of the most used in the orthodontic treatment, especially for its price, which were treated with TiO2 coating, this process is recommended as a treatment to prevent corrosion (Chaturvedi 2009). The arches coated and uncoated segments were fragmented into 1cm lb/15 autoclaved 15 min and inoculated with A. faecalis in culture medium without organic components, and finally incubated for 30 days to 35th C ± 2 ° C, the study was performed in triplicate. 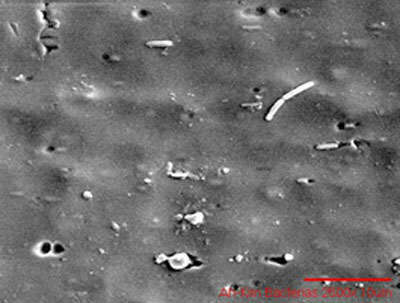 Once this time elapsed the arches were analyzed by Scanning Electron Microscopy (SEM) techniques: Secondary Electrons, Backscattered Electrons, Semi quantitative Chemical Microanalysis and Energy Dispersive Spectroscopy (EDS). This was performed before bacterial inoculation, at the end of the thirty days of being inoculated (to see the extent of bacterial establishment) and finally, without bacteria (to see the extent of damage to the material). The collection of bacteria was carried out from the arches orthodontic nickel-titanium and were kept in incubation for 30 days at 35°C ± 2°C under stationary. The samples were immersed in gutalardehyde to 70% for 30-45 minutes. After the time of fixation in glutaraldehyde, the arches were changed to progressive alcoholic solutions (at different concentrations) of 10% to absolute alcohol for 10 minutes per sample. Finally the samples were exposed and kept in a desiccators for 10 minutes. 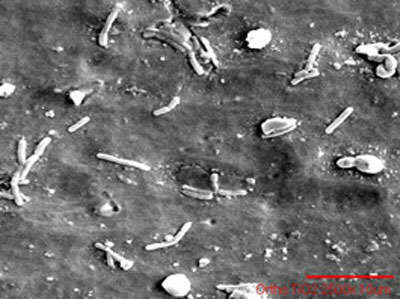 Following drying, each sample was observed under the scanning electron microscope. To assess the corrosion A. faecalis morphological level, there was a cleaning of all the dental arches with 96% alcohol molder to remove bacterial and impurities and only see the structure of the arches. This analysis was applied to the arches before and clean with 96% alcohol in order to compare changes in the proportion of elements. This technique is based on the emission intensity of backscattered electrons in SEM depends on the average atomic number of atoms in the sample, and the heavier atoms produce more backscattered electrons. 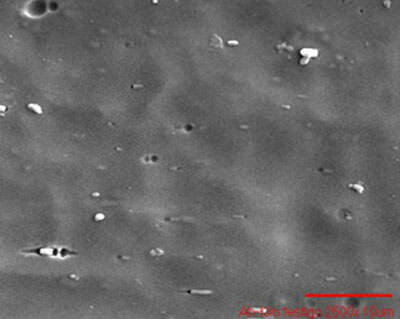 An image caused by backscattered electrons reveals difference contrast in chemical composition. The spectrum of X-radiation emitted by a mineral in the process can be used to make a semi-quantitative chemical microanalysis by spectroscopy of dispersion wavelength (EDS). The incident electrons excite the atoms in the sample and cause X-ray emission whose wavelength is characteristic of the elements present in the sample and the intensity for a given wavelength is proportional to the relative concentration of the element. Also applied the technique of secondary electrons to generate images. 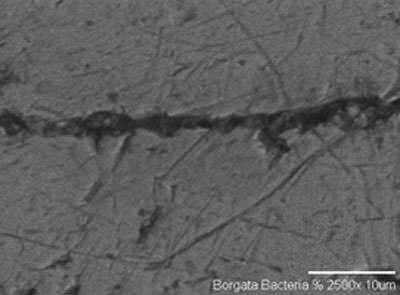 We obtained four main results of the experiment: Degree of establishment (Colonizing) bacteria in each of the dental arches, Degree of corrosion of the material, change in the distribution of the constituents and their loss due to corrosion. TiO2 coated arches of different brands (Fig. 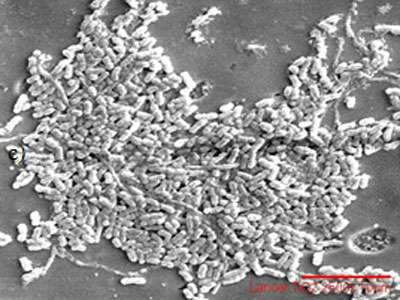 1b, 2b, 3b, 4b and 5b) had a higher degree of bacterial establishment than the corresponding arches uncoated (fig. 1a, 2a, 3a, 4a and 5a). 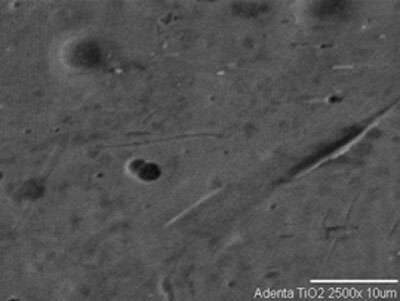 The microorganisms influence the formation of surface films, leading to lack of adherence or termination (Frontini, 2005). 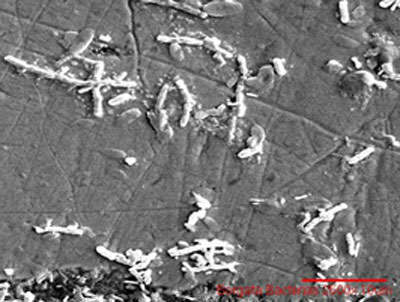 With the above, is related by biocorrosion biofilm formation derived from the establishment of microorganisms on the surface of the alloy, the discontinuous deposit on its surface and the difference in oxygen concentration that causes a redox potential as previously mentioned (Blotovogel et al. 1985). Clearly the arcs did not experience a noticeable change in the percentage of oxygen indicating that A. faecalis obtained this item directly in the middle. So we can confirm that the texture and porosity of arches of different brands (besides these qualities affected by the coating of TiO2) influence the degree of colonization of A. faecalis. The biofilm on the tooth surface together with the rest of the food and metabolic products produced in the oral environment causes a process of glycolysis where it releases carbon dioxide (CO2). Also, usually organic chemical process together with the fermentation of sugars produced organic acids, alcohols and CO2 (Christopher and Brett, 2004). Explaining that a medium with high levels of inorganic and organic compounds (secondary metabolites and other compounds that are caused by microbial activity and aid in digestion) as the mouth, directly affects the pH and that, while lower the pH, the better is the corrosion environment for bacteria. The latter would have significant effects in the oral environment, because if this bacteria is reached to establish long in large proportions, could have important medical implications (Olivares et al. 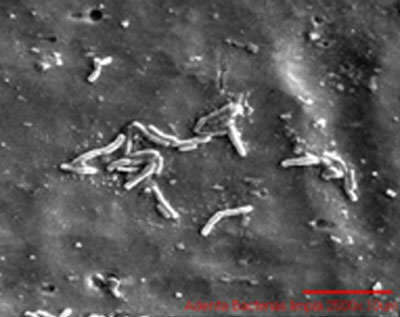 2008) then, while A. faecalis colonizing this type of alloy is possible that many other microorganisms can be determined in the same ways and have pathological consequences of importance. 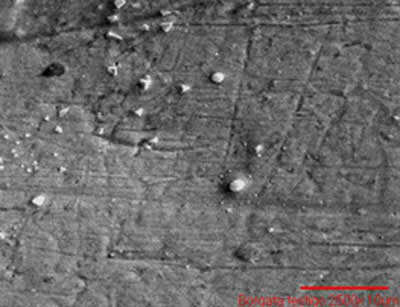 We consider the degree of corrosion observed as "Low" since all arcs (subject to environmental bacterial) of the different brands, with the exception of uncoated arc Borgatta brand (did considerable damage), had very observable physical changes including small arms controls (remember that underwent only the action of the environment). Still, without coating the arches were a little more susceptible to corrosion that coated with TiO2. Thus, I present only two examples, one where the arcs are displayed without any major physical change, and another, where the coating has an arc without damage in a small area of the arc can be significant. The orthodontic arch Borgatta brand seem to be vulnerable to corrosion by observable fractures (Fig. 7), but by observing the arc witnessed the same brand does not reveal that they have a texture more fractured. We found by metallographic examination, these arches behaved the same way as those of some other brands except ADenta. Change in the distribution and loss of constituents elements due to corrosion. The dental arches were no significant changes in the distribution of structural elements due to biocorrosion as we shall see below. 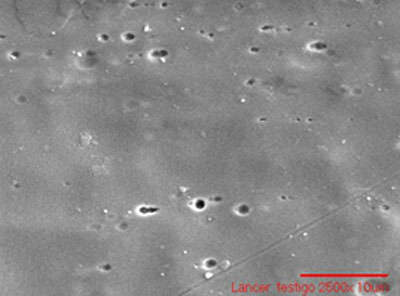 Thus, only expound the photomicrographs which were only possible outside the arches seem to have more damage (bows Borgatta) as mentioned before (Fig. 7). Still, this does not mean there is or there is no loss in the proportion of constituent elements.Could quantify the mass percentage (% Wt) of each of the elements that constitute them. Ni-Ti arches are generally resistant to the action of A. faecalis, noting the arches uncoated exposed to bacteria that were able to perceive a higher percentage but very small compared with those with a coating of titanium oxide (TiO2). This essentially shows that these arcs with a layer of TiO2, makes them more resistant to bio-corrosion. ADenta arches were more affected by corrosion to not having a titanium oxide coating. The ADenta arches which has a titanium oxide coating was a significant corrosion resistance compared to uncoated arc. However, the latter has suffered losing share of its constituent elements compared with the control (Table 2). 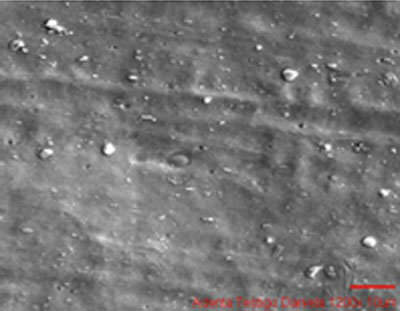 Photomicrographs showing the extent of corrosion orthodontic arches "Borgatta". Final percentage of the elements of arches of the trademark "ADenta" (Witness, uncoated and coated) when subjected to ambient bacteria. It can be observed that especially the arches ADenta contain other elements not specified in the product features. In addition to the cost of that, the proportions of the main materials of the alloy (Ni-Ti) are found in low percentages. This can be distinguished and compared to observe the initial and final elements of the arches brand Borgatta (Table 4 and 5). Initial percentage of the elements of arches of the trademark "Borgatta". Final percentage of the elements of arches of the trademark "Borgatta". Other brands had the same behavior. Clearly the arcs did not experience a noticeable change in the percentage of oxygen indicating that A. faecalis obtained this item directly in the middle. So we can confirm that the texture and porosity of arches of different brands (besides these qualities affected by the coating of TiO2) influence the degree of colonization of A. faecalis. (And Vörös et al. in research on surface characterization of titanium, 2001), considered the physical and chemical characteristics and topography for orthodontic materials and design factors that must be recovered to describe the quality of any of these materials: Table 6. 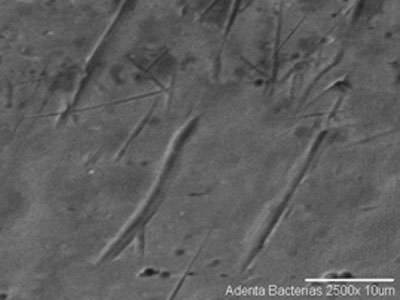 Alcaligenes faecalis, could be, considering many factors, bacteria have a role in bio-corrosion of arches used in orthodontic treatment. The arches of the five brands: ADenta, AH, Kim, Borgatta, and Ortho Lancer, which are subjected to a coating of TiO2 (Titanium Oxide), are more resistant to biocorrosión A. faecalis. The physic-chemical structure and morphology of different orthodontic arch (regardless of brand) affects the success of establishment of the bacterial strains. The case of A. faecalis was no exception. Alloys include among its components nickel have this element to a percentage greater than 50%, and have sufficient potential for the release of same in the oral environment, which can cause biocompatibility problems. 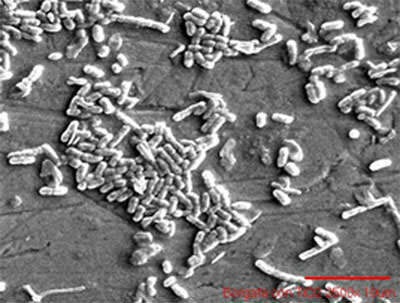 A. faecalis, a facultative anaerobic bacteria outside the oral bacterial biota but persistent in the environment and medical important, it get the nutrients necessary for dental material used for orthodontic treatment and cosmetic dental reconstruction and thus causing it should be fixed efficiently and with great frequency in these materials can cause them a wear. 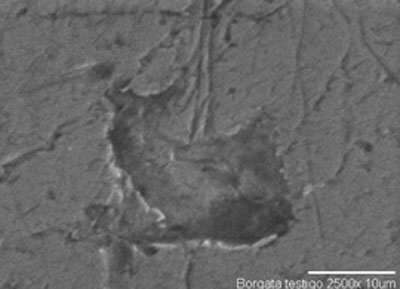 In vitro techniques, as in many areas, have been a good model for investigating bio-corrosion processes of materials in contact with humans, because they can create similar conditions to be carried out this process and monitor it. This has led to the successful design of more comfortable materials for our health. If anything will keep us relieved so far, is that our innate immune system, saliva, dental enamel, the daily hygiene and other bacteria of the normal oral flora necessary to provide the defense so far, records of pathology allergens by nickel or other compounds that make up these materials and by A. faecalis is kept low. Al-Waheidi, EM. (1995). Allergic Reaction To Niquel Orthodontic Wire: A Case Report. Quintessence Int. 1995; 26:385-387. Barret, R.D., Bishara, S.E, Quinn, J.K. (1993). Biodegradation Of Orthodontic Appliances. Part I: Biodegradation Of Niquel And Chromium In Vitro. Departamento de Ortodoncia, College of Dentristry, Universidad de Iowa. Bass JK, Fine HF, Cisneros GJ. Nickel hypersensitivity in the orthodontic patient. Methanogen. Archives Microbiology. Springer Berlin Editors. Chaturvedi, T.P. (2009). Una Revisión Sobre la Corrosión De Los Metales En Ortodoncia. Facultad de Ciencias Dentales, Instituto de Ciencias Médicas. Universidad de Banaras Hindú. India. Christopher, M., Brett, A. (2004). Influence Of The Biological Fluid On The Corrosion Of The Biological Fluid On The Corrosion Of Dental Amalgam. Corros. Sci., 2004; 46:2803-2816. Costerton, W.J. (2003). 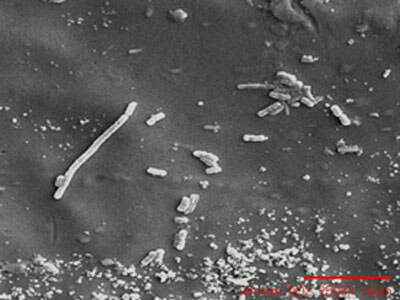 Microbial Biofilm. Vol 5, Ann. Rev. Microbiol. Cambridge University Press. Frontini, M. A. (2005). Corrosión Microbiológica. Tesis de Magister en Ciencia de Materiales, Fac. de Ingeniería, Universidad Nacional de Mar del Plata, Argentina. 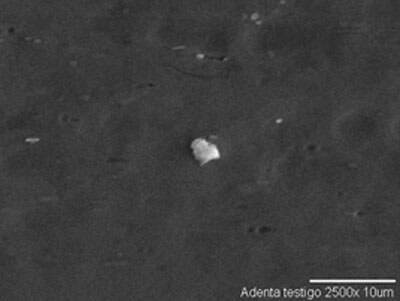 ISSN 1668-4788. Graber, T. (2006). Ortodoncia: Principios Y Técnicas Actuales. 4ta. Edición, ed. Elsevier Mosby, España. Henrich, V.E., Cox, P.A., (1994). The Surface Science Of Metal Oxides. Cambridge University Press, Cambridge. MacFaddin, J.F. (2003). 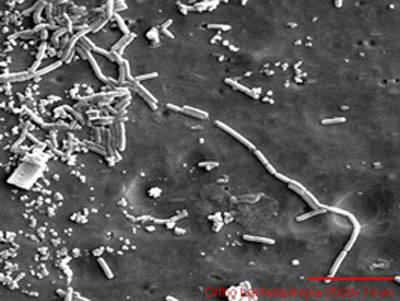 Pruebas Bioquímicas Para La Identificación De Bacterias De Importancia Clínica. 3ra. Edición. Ed. Médica Panamericana (Traducción al español), Buenos Aires, Argentina. Martínez, K. (2009). Corrosión Biológica En Arcos Dentales Utilizados En Ortodoncia. Tesis de Licenciatura, UMSNH, Michoacán, México. Olivares, M.F., Palenciano, J.B., Cerrada, M.G. (2008). Casos Clínicos: Otitis Media Aguda Por Alcaligenes faecalis. Rev. Extremadura Médica, Sección: Microbiología. Hospital Universitario Perpetuo Socorro. Badajoz. España. Tengvall, P., Lundström, L. (1993). Physyco-chemical Considerations Of Titanium As a Biomaterial. Clint Mat. 9, 1993; 115-134. Vörös, J., Wieland, M., Ruiz-Taylor, L., Textor, M., Brunette, D.M., (2001) Characterization Of Titaniun Surfaces. En "titanium in Medicine: material science, surface science, engineering, biological responses and medical applications"; Berlin (2001), 87- 144.